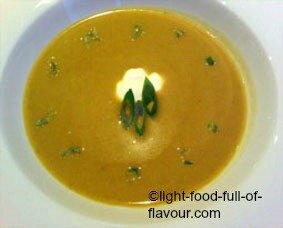 Do you want a recipe for a tasty and healthy soup to warm you up? This fantastically tasty, velvety and subtly spiced lentil and carrot soup is the perfect soup for a cold autumn’s day. It’s easy to make, filling, low in calories and healthy. What more can you ask for! If you want more heat, add some chopped chilli before serving the soup. I sometimes add thinly sliced chicken breast that I marinate in a little bit of oil and the spice-mix Ras-el-hanout before stir-frying over a high heat. It does make the soup into more of a meal. Or, for a vegetarian version, toss cooked chickpeas in warm olive-oil infused with plenty of ground cumin and add it to the soup. Adding protein-rich food such as chicken or chickpeas to the soup will make it much more filling. 1. Heat the oil in a large pan and fry the onion and carrot for five minutes over a medium heat, stirring every now and then. Add the garlic and spices and fry for another minute while continuing to stir. 2. Add the lentils and stock to the pan and season with salt and pepper. Bring to the boil, then lower the heat, cover the pan with a lid and simmer for 25 minutes. Lift the lid a couple of times and give the soup a good stir. 3. Remove the soup from the heat and let it cool down a bit. Either blend the soup until smooth with a stick blender in the pan or use an ordinary blender (depending on the size of your blender, you might have to do this in batches) and then return the soup to the pan. If you find that it is too thick, simply add some water. 4. Add the lemon juice to the lentil and carrot soup, reheat and check the seasoning. Serve with a dollop of yogurt and a scattering of chopped spring onion (scallion).